Harvesting the grapes. In the far distance is the Tajik Aluminum Company (TALCO), located in Tursunzade. 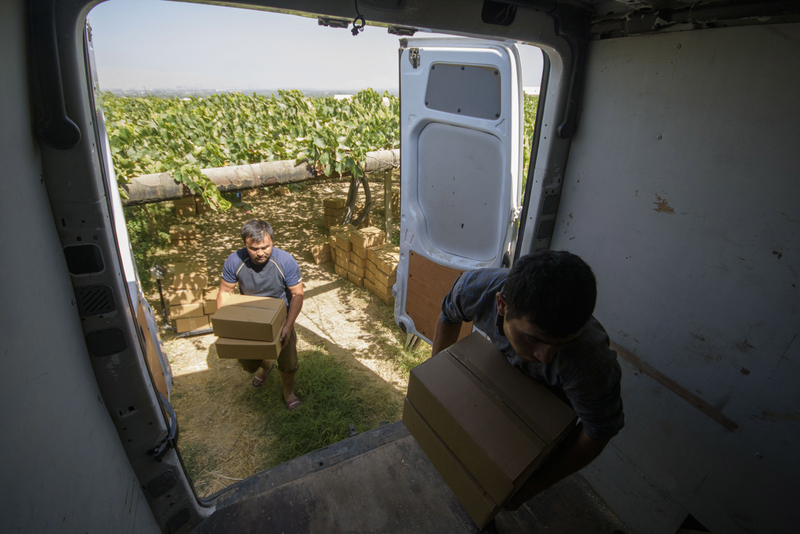 A driver from Osh, Kyrgyzstan (left) helps load boxes of grapes into his van. 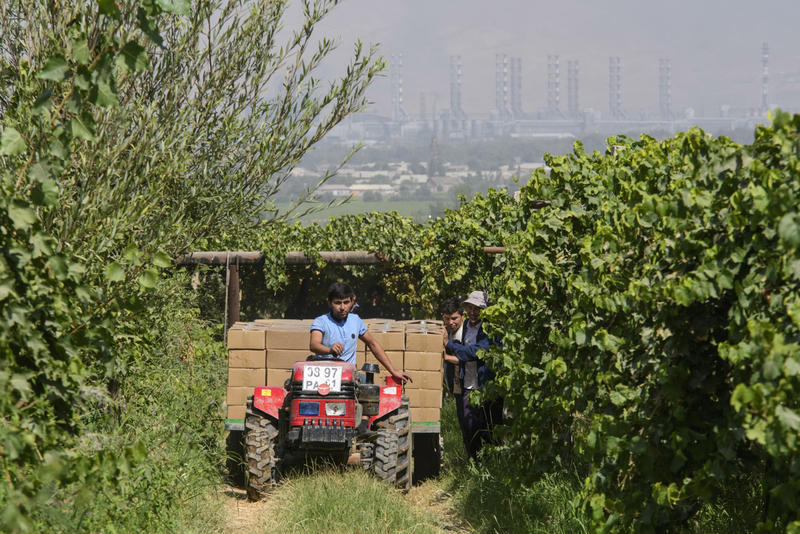 A tractor takes grape-filled boxes out of the garden. Young workers harvest grapes in the vineyard. Husain grapes are loaded into boxes. 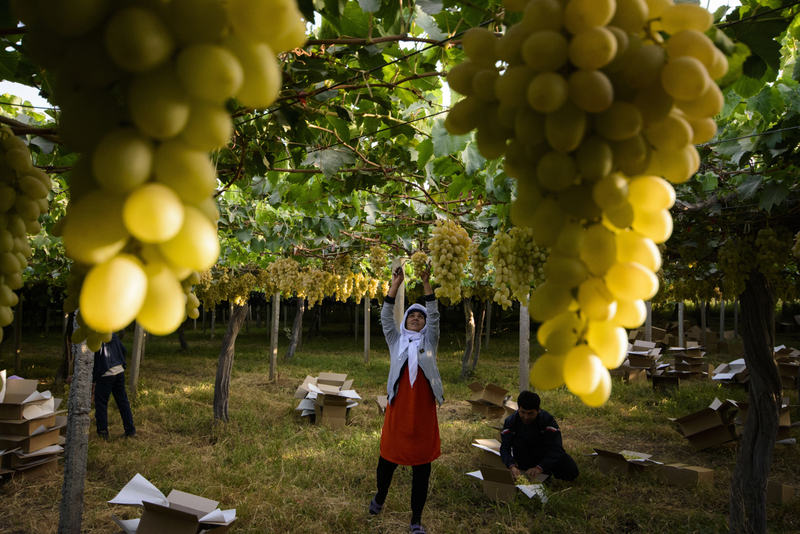 A group of workers harvest grapes of the grape variety "Husain." A young man collects grapes. 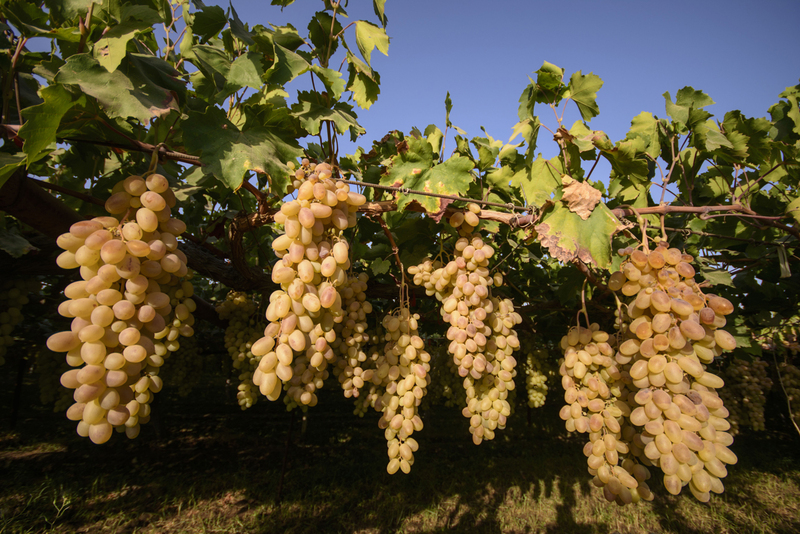 The abundant sunshine lends Tajik grapes a distinctively sugary taste. Even as one approaches by car, laden vines hang temptingly in rows by the side of the road. 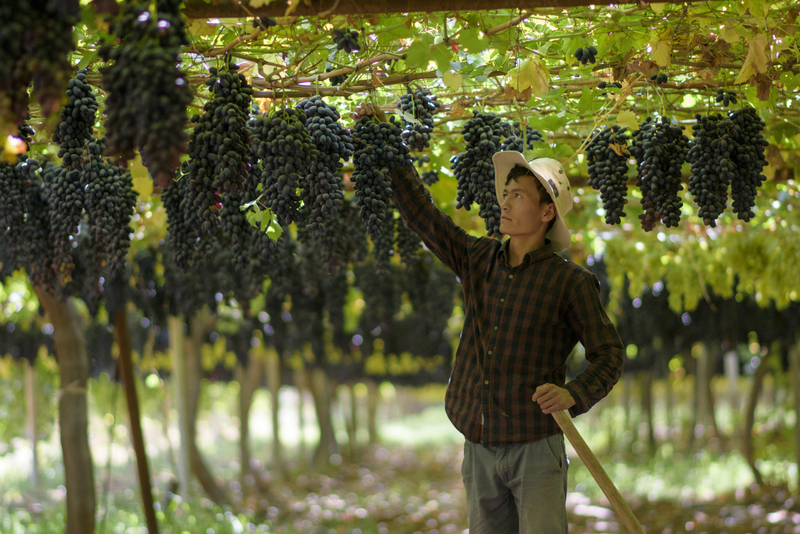 In the village of Yangibog, outside Tursunzoda, the grape-harvesting season begins around the end of July and lasts several weeks. 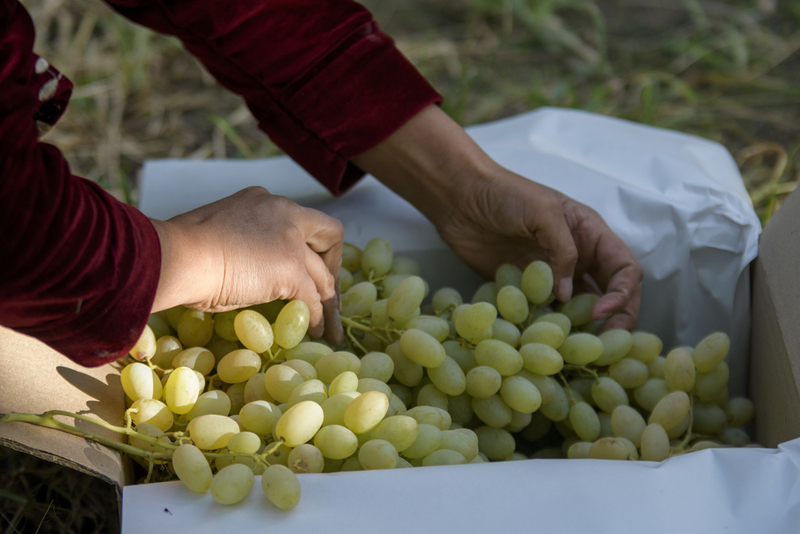 The strains grown there are table grapes – intended for consumption while fresh and not for wine – and include the black Pobeda, Lady Finger of both colors and Husain white. 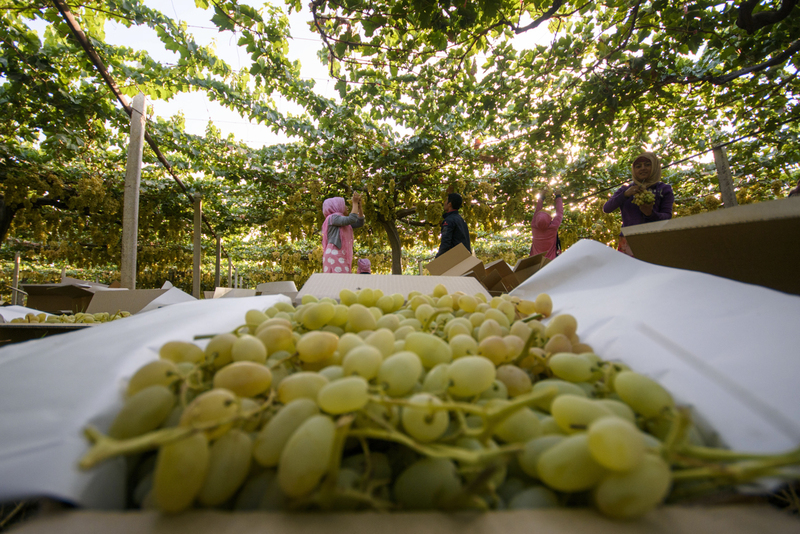 The abundant sunshine lends Tajik grapes a distinctively sugary taste. Care for the plants is an all-year endeavor. The vines are pruned in February. Fertilizing the soil and exterminating pests is an unremitting duty until harvest time. 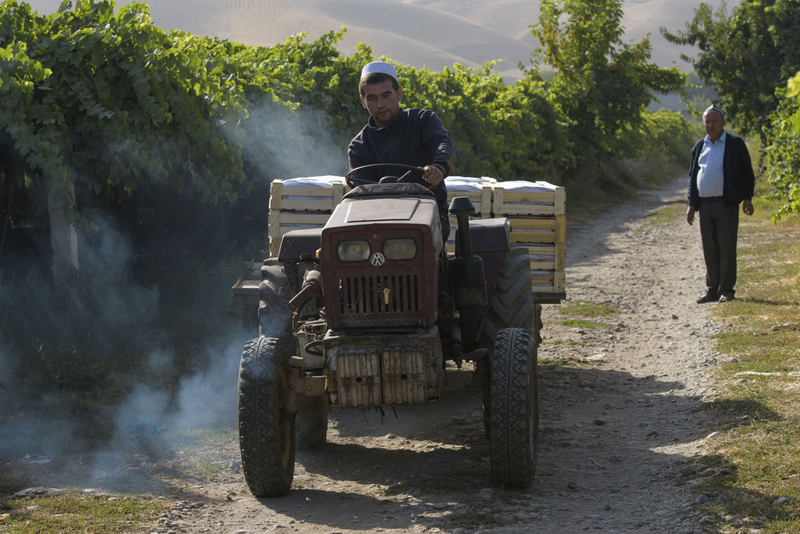 The grape-growing industry is a slow-expanding one in Tajikistan. Yields last year came in at 229,000 tons, a slight increase of 14,000 tons on 2016. Exports in 2017 also grew, by 7,000 tons, to 20,000 tons, netting a relatively meager $4 million. The traditional export destinations are Kazakhstan, Kyrgyzstan, Pakistan, Russia and Belarus. 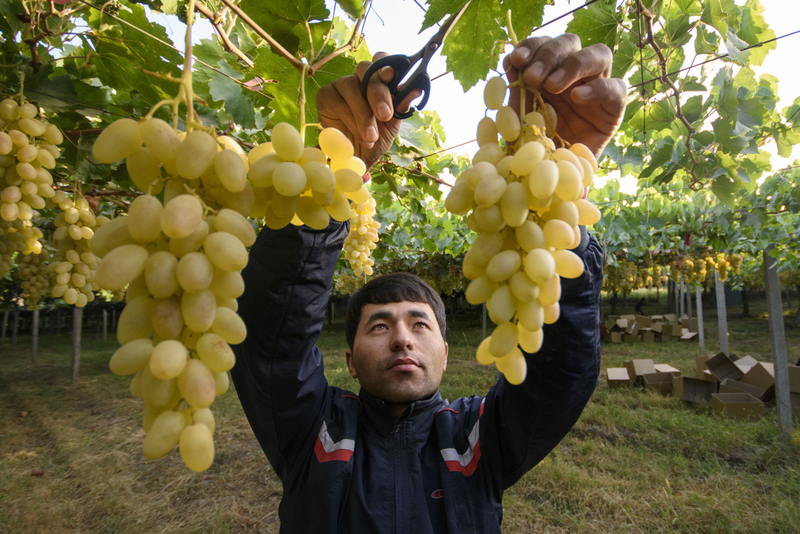 The United Arab Emirates and Uzbekistan also began importing Tajik grapes last year. “For the whole of 2017, we exported 34 tons to Uzbekistan. Since the paths [between the two countries] opened in 2018, we expect the figure for this year to be several times greater,” said a representative for the Statistics Agency. What few know is that Tajikistan even once had a wine industry of some repute. 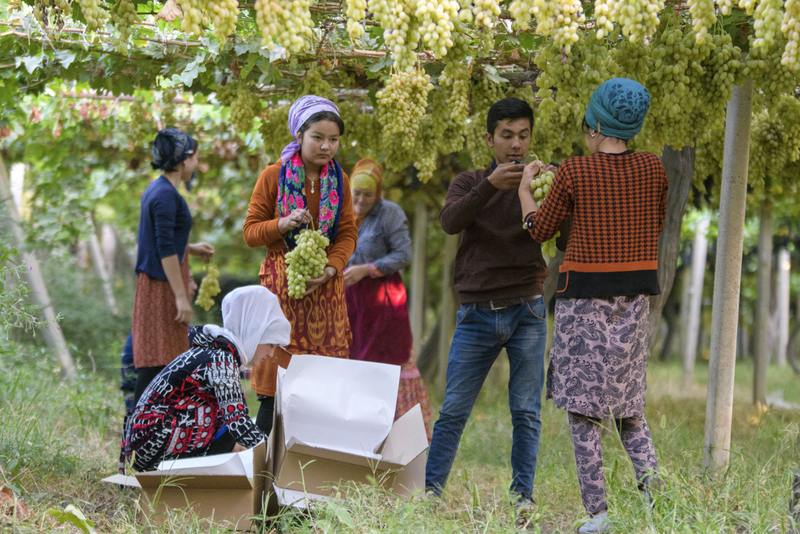 As Ikrom Kurbanov, a one-time Minister for Food Industries, told Asia-Plus newspaper last year, in Soviet times the Tajik SSR produced 6 million decaliters of wine annually. Two million decaliters was held back for local consumption. But today, as Asia-Plus mournfully noted in its survey on the state of the industry, Tajikistan produces almost no wine at all. And what it does make is of dubious quality, unfit for export. Back in Yangibog, cultivators insure against the vagaries of weather by staggering their crop over three varieties for early, medium and late ripening. This means that even if one batch is ruined by unseasonable weather, not all is lost. Harvesting is a source of meager but valuable income to villagers living in the vicinity of the vineyards. Picking begins at five in the morning. This work is nowadays mostly done by women. For anywhere between three and four months, grape-pickers can expect to earn 30-40 somoni (around $5) for a day’s work. Nozim Kalandarov is a photographer based in Dushanbe, Tajikistan.